So come for a visit. 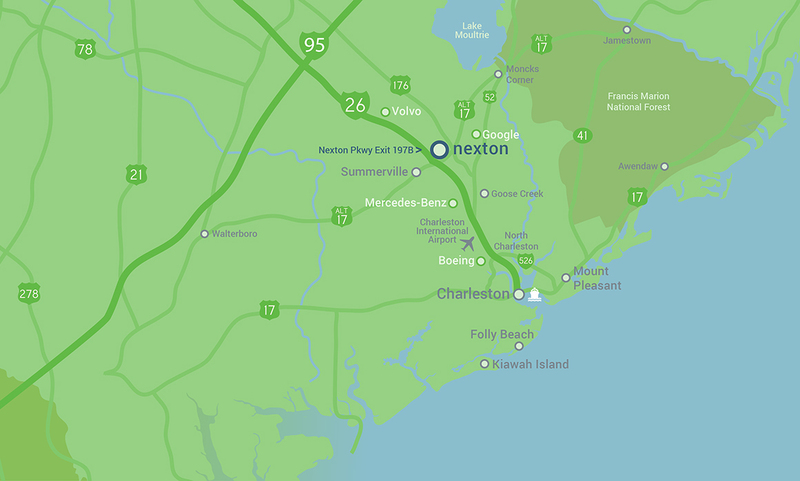 Nexton is just 25 miles from historic Charleston and five miles from downtown Summerville. Start your tour at the Greeting House, where you'll find lots of information and maybe a little something to sip on. Then experience the fresh Lowcountry style of our model homes. Take a stroll to the Great Lawn and the Swim Club. Maybe catch a concert at Brown Family Park. And discover what makes Nexton such a wonderful place to live. Ready to learn more? Stop by the Greeting House for a cold drink and Powerbyte to learn about our thoughtful design. We can dive into the amenities and give you an overview before you hit the models. Soon, Nexton residents will be walking, biking, and scootering their way to the hottest new shopping and dining destination: Nexton Square. 22 tenants announced. Learn more. Seven esteemed builders. Sixteen fully furnished model homes. Fifty-eight home plans. Countless ways to inspire you. All waiting right here at Nexton. Learn more. To celebrate Earth Day, we’re encouraging everyone to explore the green spaces at Nexton with a little friendly competition! Learn more. and tour dozens of model homes. Nexton has a location that puts the entire region at your fingertips. And with Charleston growing right up the I-26 corridor, this is the place to be. *Map not drawn to scale and for illustrative purposes only.